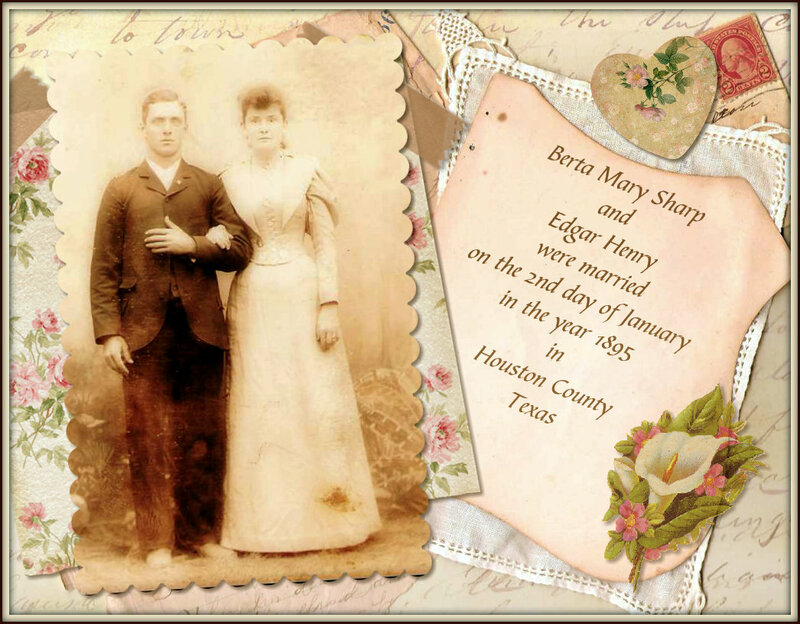 On this date in our family history . 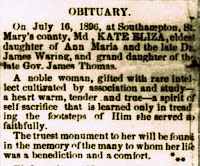 . . the 16th day of July in the year 1896 . . . Katherine Elizabeth Waring died in Maryland . . . this "Kate Eliza" is a first cousin four times removed to the Keeper of this family history blog . . .
On this date in our family history . 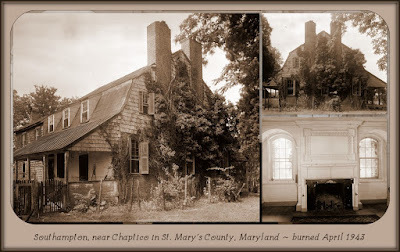 . . the 12th day of July in the year 1867 . . . Catherine Ann "Kitty" Waring nee Waring dies at Southampton, home of her son, in St. Mary's County, Maryland . . . according to the DAR "Eye on Elegance" website . 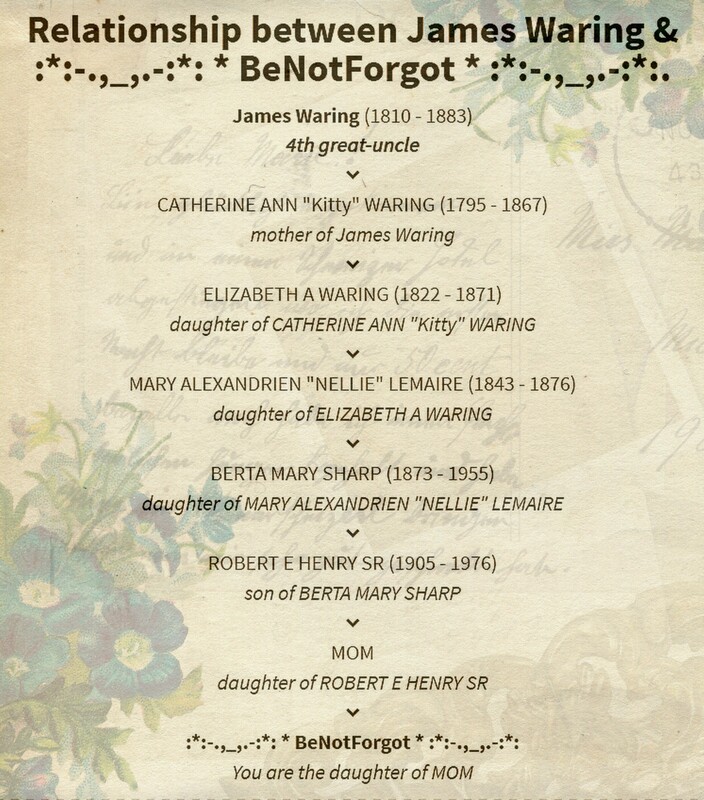 . .
Catherine “Kitty” Waring lived in southern Prince George’s County and married her cousin Edward Gantt Waring before their move to Texas in 1840. 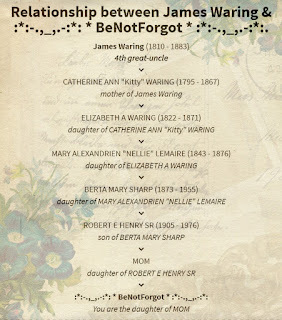 In the 1850 slave census, three African-Americans, including two women, lived at the Waring farm [in Liberty County, Texas]. Perhaps they were there to help with the quilt a few years earlier. 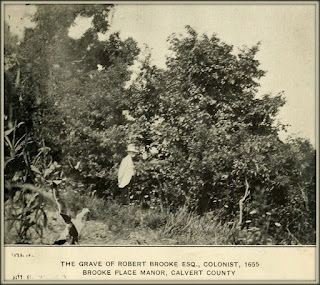 Edward died in [sic, i.e., before] 1850, and by 1860, Kitty had returned to Maryland. 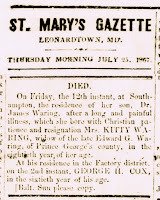 Back in Maryland, Kitty would apparently live out her days in the Southampton home of her son, Dr. James Waring . . . 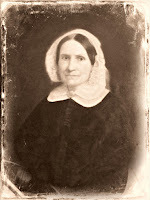 This Kitty is a 4th great-grandma to the Keeper of this family history blog . 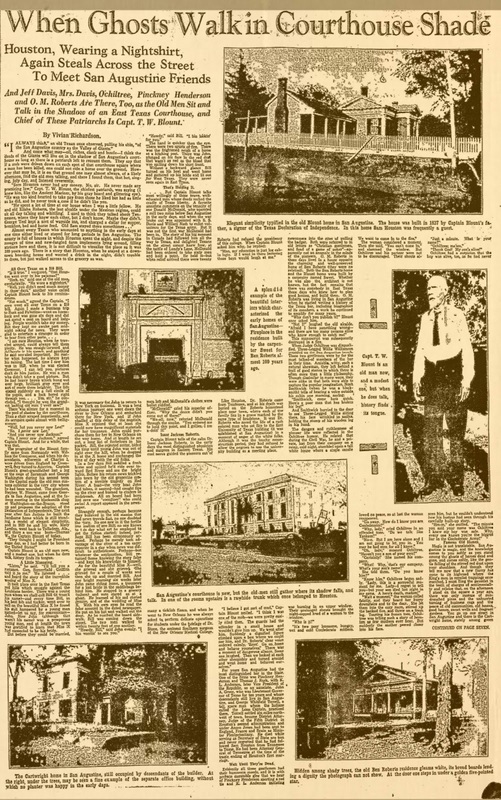 . .
On this date in our family history . 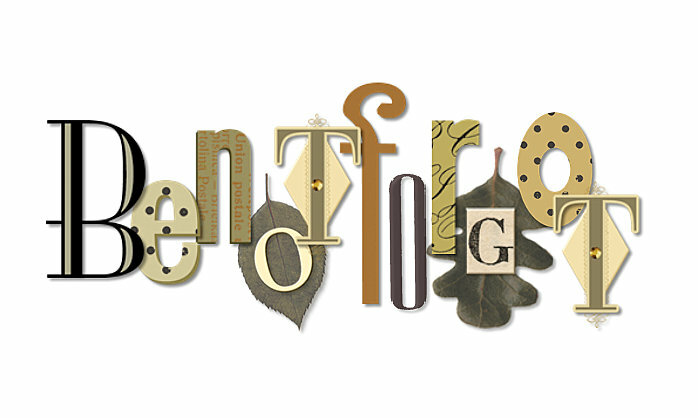 . . the 10th day of May . 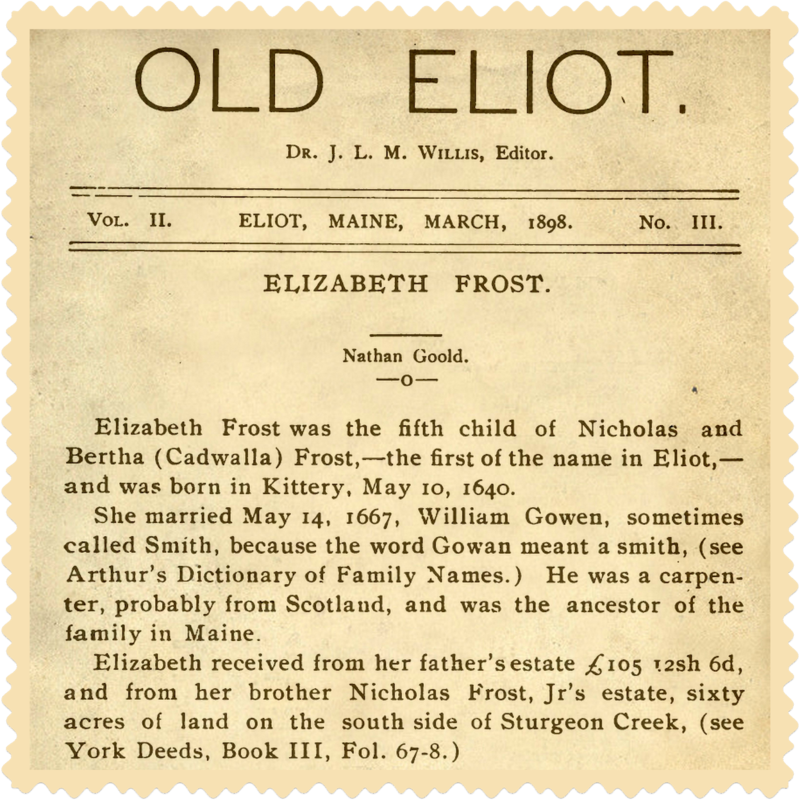 . . in the year 1640 . . . a baby girl is born to Nicholas Frost and Bertha Cadwalles . 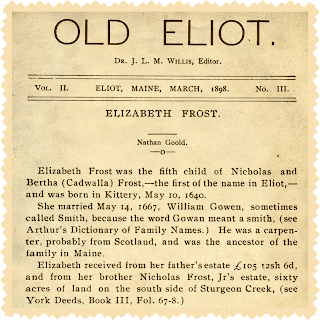 . . it is said that Baby Elizabeth was the first of the name of Frost born in Eliot, Maine . 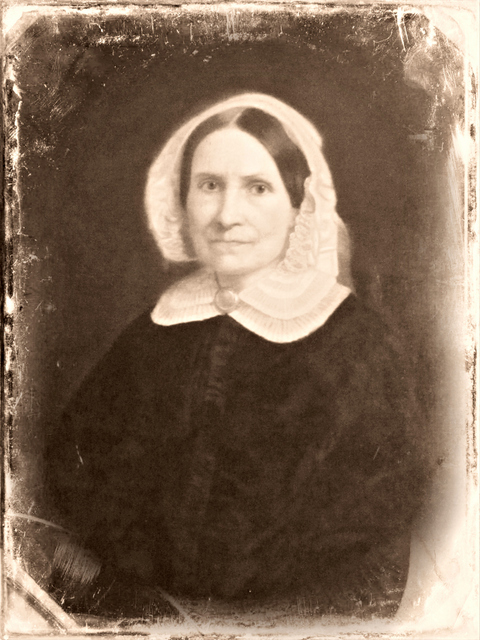 . . this Elizabeth is a 9th great-grandma to the Keeper of this family history blog . . .
175 years ago today . 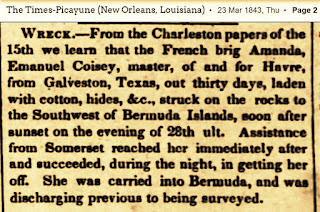 . . on the 23rd day of March in the year 1843 . . . the following news clipping appeared in a Louisiana newspaper . 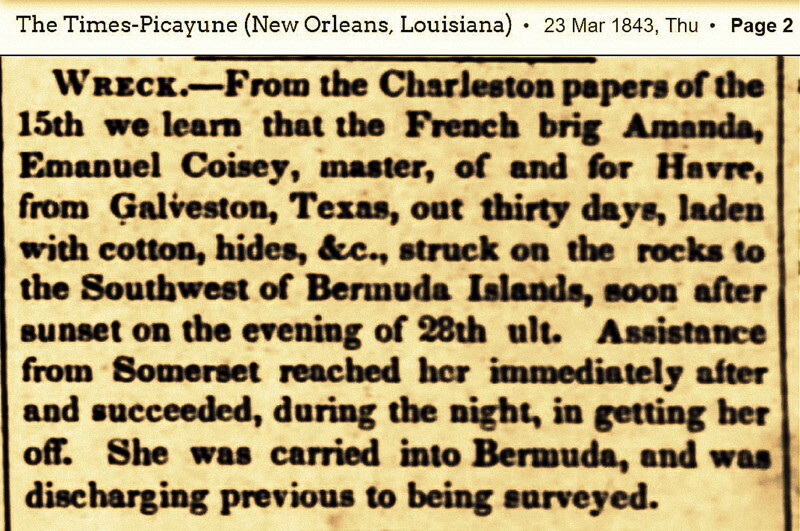 . .
One of the passengers on "the French brig Amanda" was Alexander Lemaire, who is a 3rd great-grandpa to the Keeper of this family history blog . . . the Amanda was never heard from again after leaving Bermuda . . .